You may have noticed the gaining popularity of Thai cuisine as it makes its way into more restaurants and menus. Although typically associated with seasonings that make many Americans' eyes water, the heat factor can be adjusted when you are making dishes at home. That's why we are excited to have a new Organic Thai Seasoning blend by Frontier in our bulk section! For your culinary enjoyment, we recommend pairing this seasoning with our Fresh-Ground Organic Peanut Butter to make this Thai Peanut Dip. Recipe below courtesy of Frontier. 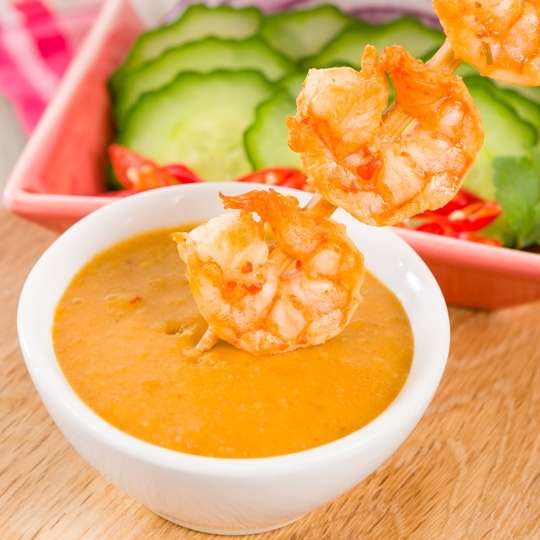 This simple and healthy take on Thai dipping sauce goes great on cooked noodles, wraps, spring rolls, or just as a side dish for veggies and shrimp. 1 teaspoon Frontier Crushed Red Chili Peppers 1.20 oz. Stir together all ingredients until smooth. For a thinner sauce, add more coconut milk. Enjoy!